Digital projectors, data projectors, beamers, multimedia projectors, whatever you call them – they have come a long way since their introduction in the mid 90’s. Whilst technology has moved along and image quality has been transformed, the same basic principles still apply when choosing a projector to hire for business presentations. and in this quick guide to projector rental we’ll discuss them all in some detail below. Projectors come in a wide range of light outputs, which are measured in ANSI lumens or lumens for short. 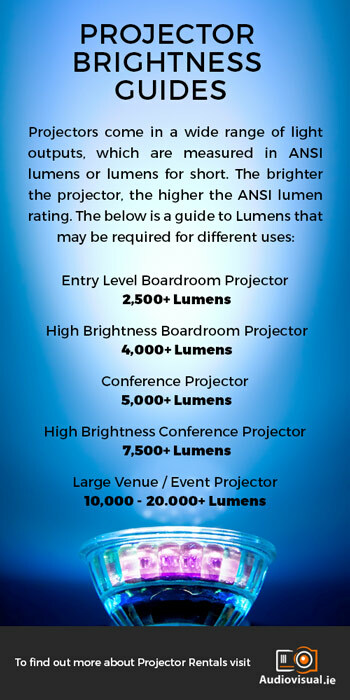 The brighter the projector, the higher the ANSI lumen rating. The brightness spec required depends on a few factors. The amount of ambient light in the room: The brighter the room the high the brightness projector required. Content being displayed: Presentations generally require higher brightness . Movie & Video applications are generally displayed in a darkened environment thus lesser brightness will suffice. In my opinion – the higher the resolution the better! Up until a few years ago most standard rental projectors were XGA resolution (1024 x 768) but more recently WXGA, Full HD & WUXGA resolutions have become common place. The most important point to note is the shift here form 4:3 square format to 16:9/10 widescreen format. More detailed content i.e. spreadsheets, web pages etc. will look better on higher resolution projectors. However, because there is more definition and screen area, content will also look smaller and therefore a larger image size may be required. The resolution refers to how many pixels (W x H) are displayed on a screen. The most poplar ways to connect to a projector are using HDMI & VGA cables. HDMI will support High Definition signal as well as carrying audio to the projector. VGA is still very popular. Other used connectors are SVHS, Composite, DVI, RGBHV & HDBaseT. Check in advance what you are using and that it is available on the projector rental as there is nothing worse than being a cable or connection short. For more check out our guide to AV Connectivity. It goes without saying – are you moving the projector around? Make sure you don’t need to hire a small crane along with your projector rental……It might sound obvious but overlook this point at your (and your backs) peril! Image size generally depends on audience size. For smaller meetings the most popular is a 180cm or 200cm (wide) tripod screen. As a rough guide, this will cover an audience from 1+ up to 60 people. To determine the size of screen you need, measure the distance from screen to the audience member that will be farthest from the screen. Your screen height should be about 1/6 of that distance. The throw distance is the distance from the projector to the screen. Consider whether there are any restrictions in relation to where the project can be placed. Most projectors have a zoom lens which allows a bit of play in terms of throw distance. Large conference & venue projectors have interchangeable lenses which provide much greater flexibility. A handy shortcut to connect to a projector using windows is to press Ctrl + Windows logo key + P. This displays the projector settings window where you can choose how to display your desktop. Simple, but a real time-saver! Need To Hire A Projector? Need to hire a projector but have a niggling question that you’d like answered before hiring? Want to speak to an AV expert? Then call us on +353 1 4133892, contact us online or email me directly ivan@audiovisual.ie and be happy to help. Feel free to comment below with any questions either and I’ll follow up there. Pingback:Are You Getting The Right Audio Visual Equipment?